Vendors Say Mobile Payments at Vending Machines on the Rise | NFC Times – Near Field Communication and all contactless technology. 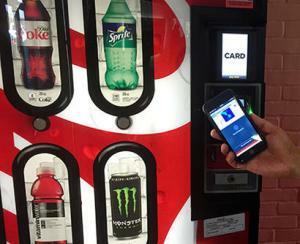 The Coca-Cola Co. has predicted mobile payments will account for up to 20% of sales from its vending machines in the U.S. within five years. Vendors of cashless payments for the unattended market already see higher transactions and purchase amounts. NFC Times Exclusive Insight – Suppliers of cashless payment for vending machines predict the rollout of Apple Pay, along with planned introduction of Android Pay, will continue to reduce the use of cash at U.S. vending machines and will also lead to higher transaction amounts, though did not release actual figures. Cashless payments include contact EMV cards and, more commonly in the U.S., mag-stripe cards, as well as contactless EMV cards and NFC mobile payments. Mobile payments still hold only a small share of overall cashless sales at vending machines, but they are growing, according to Maeve McKenna Duska, vice president of marketing for vending machine payments technology vendor USA Technologies. They are easily pulling ahead of contactless bank cards, which are not being widely deployed by U.S. banks for their new EMV cards, after having been introduced as contactless-only bank cards several years ago. “NFC-mobile payments are still a small percentage of overall cashless sales, but since the introduction of Apple Pay and (soon) Android Pay, mobile NFC payments have been rapidly overtaking contactless cards,” she told NFC Times. She did not, however, say how quickly mobile payments were gaining ground in relation to contactless cards, or what percentage of USAT’s transactions mobile currently accounts for. Article has about 1460 words.